What's the Correct Mowing Height for Your Lawn? Follow the rule of one-third for a healthy lawn. In a race to save time, many of us cut lawns too low in hopes of reducing the frequency of mowing. By doing so, we unintentionally weaken the lawn. Like all plants, turfgrasses produce energy through photosynthesis, which takes place in the leaves. When we remove too much leaf surface at one time, we reduce the lawn’s capacity to produce food. As a result, grasses produce smaller, shallower root systems that are less resilient to stresses including drought, high temperatures, insects, and diseases. For a healthy lawn, follow the rule of one-third when setting your mowing height. This rule tells us never remove more than one-third of the leaf blade at a time. Following this practice, the height at which we maintain our lawn determines how low to set the blades and how often we need to mow. 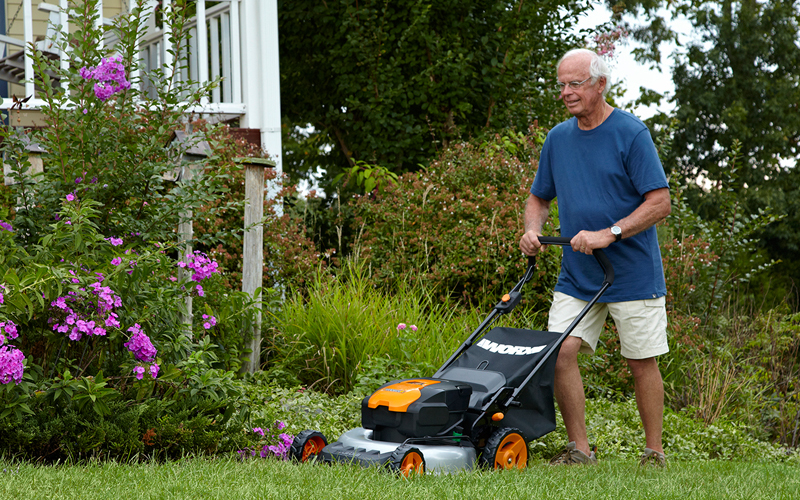 WORX high performance lawn mowers have easily adjustable decks that allow you to set mowing height within a range of 1.2 to 3.5 inches. Proper mowing height depends upon the type of grass species in your lawn. Use the chart to determine the best height for your yard. In lawns with mixed turf species, use the higher recommended setting. As a general rule, taller turf stands tend to be healthier and more resilient to weeds, drought, and other stresses. And contrary to popular belief, shorter lawn heights require more frequent mowing. Mowing height also varies by season. For warm-season grasses, raise mowing height in fall as the growing season winds down to provide insulation against cold temperatures. Cool-season grasses are quite the opposite. Raise mowing heights during the hot summer months to insulate crowns against high temperatures and promote deep root growth. Once you determine the ideal height to maintain your lawn it is easy to establish good mowing practices. To apply to rule of one-third, adjust mowing frequency according to plant growth. For example, to maintain your lawn at a height of two inches, wait until the grass has reached a height of three inches before mowing. At that time, you can remove one-inch of the leaf blade, an amount equal to one-third the total height, by setting your mower blade to two-inches. Several factors influence the rate at which turf will grow, including soil moisture, nutrients, and temperature. As growth rate fluctuates throughout the season, the frequency of mowing also changes. During rapid periods of growth in the spring, for example, lawns may require mowing every four to five days to maintain an ideal height. The drier summer months will require less frequent mowing. Adjusting your mowing practices to follow the rule of one-third will result in a vigorous, more robust lawn. The following mowing tips will also help in maintaining healthy, productive turf areas. Leave grass clippings in place to return nutrients to the lawn. Alter mowing patterns with each mowing to reduce wear and avoid compaction. Make turns on sidewalks and driveways, or make wide turns to avoid tearing turf. Are you ready to get mowing? If so, click HERE to view a great selection of lawn mowers. Did you know that many of us cut our lawns too low? For a healthy lawn, follow the rule of one-third when setting your mowing height. Here's how you do it!